I can hardly believe it, but in just a couple of months, my twins will be turning two! This second year has gone far faster than the first, but I still haven’t forgotten the early days. As much as I tried to prepare myself for having two babies, there was still a huge adjustment period when they were born, and the learning curve continues! Caring for two babies’ needs and responding to their individual likes and dislikes is massively rewarding, but it’s also hard work! 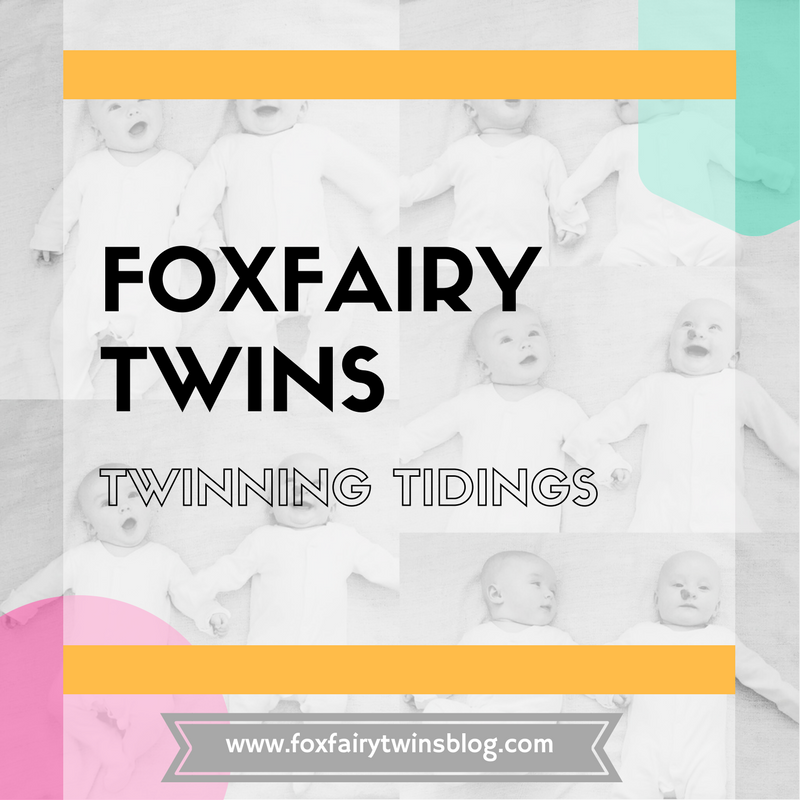 Here are a few pieces advice I would offer to anyone with newborn twins. You can’t always do it all and you can’t feel bad about it. With the best will in the world, and even with all the bouncers/swings/rockers and your house looking like a creche, you just can’t. Sometimes one baby does have to cry for a little bit whilst you are doing something else. There might even be times when both will cry and you can’t figure out what’s wrong. And yes, you probably will feel like a mean mummy, but you are doing your best! There are also some things that have to be non-negotiable, like a daily shower (even if it is only 2 minutes to feel human again). It may sound harsh to some but there is nothing more you can do than your best. Don’t feel too guilty about taking little shortcuts that make life easier. The newborn stage is not forever (though it might feel like it at 4am when you’re still up with one or two colicky babies). So, if you need to have the odd takeaway to give you time to work on that mountain of laundry, do it. It really helps to get organised where you can with twins. Not only do you have to pack a changing bag for two and no doubt manoeuvre a huge pram in and out of the car and house, but all the places you used to frequent are a new experience with two babies along for the ride. If you are heading to a shopping centre, for example (and especially if you are going it alone), it will be ten times more manageable if you can snag a parent and child parking bay. And it’s handy to know where the best changing facilities are, should you need them. Get out for fresh air every day. When you’re running low on sleep and it takes so long to get everyone ready and out the door, it may be the last thing you feel like doing. But it can make the world of difference. People find twins fascinating and will always stop to talk to you. You will probably hear the same old clichés over and over, but you’ll never tire of people telling you how beautiful your babies are and how well you’re doing for getting out of the house! There are some things you just can’t do on your own – and you only find out through experience. It is difficult at times, and I never shy away from admitting that when asked. But the trials and tribulations are overshadowed when you experience the huge sense of pride that goes along with nourishing and nurturing not one, but two small babies! Always think ahead of items that you will need in the future and buy them during the sales. I bought our two high chairs and stair gates when the babies were 2 months old, ha! I know it may sound ridiculous, but I know they are items we will definitely need so I wanted to make sure we got them at the best price possible. Parent Hacks: The ‘Lift and Burp’. When feeding twins, once they have strong neck control you can lift one baby to burp whilst the other one finishes their feed. CAYG (Clean As You Go). This has literally saved me from living in an environment similar to Jumanji. For example, as I finish changing a baby’s nappy I make sure I have wiped down the changing mat, restocked the nappy bag tin and packed away any stray clothes before I leave the room. This means I don’t have to go back in later to tidy before the next nappy change. No matter how tired I may feel in the morning, I always wash my face and put a little bit of make up on. I found this helped to lift my mood and feel more human. And coffee. Lots of coffee. Ooooh AND dry shampoo. Dry shampoo will be your best friend. Parent Hacks: Prop a book over the sofa and put your babies underneath to keep them entertained. But following on from that last point, please remember that babies will cry! It is how they communicate. So long as they are not hungry, have a wet nappy, cold/hot, unwell or need comfort, they are probably just expressing themselves (in the noisiest way possible…!) Don’t be alarmed. I try and keep myself sane in these situations by singing along with their cries. If you are finding the crying too much, take a couple of minutes and then go back to them. So long as they are safe where they are they will not come to any harm. Then once you feel ready you can go back and continue to distract / comfort / dance / sing through the cries. Good luck! If you need to entertain your babies whilst you have 5 minutes to get dressed / brush your teeth / have a wee… use the washing machine as the ultimate #freebabyentertainment. Works every time for us! Do not spend more money than you need to on baby vests. Buy the basic ones. No one will see them and I can guarantee that they will be stained with yellow poo. Don’t waste your money on expensive poo catchers. That’s just silly. To keep tummy time interesting, use patterned bibs to encourage your baby to keep their head up for as long as possible. Parent Hacks: Use a patterned bib to keep your baby entertained during tummy time. Do you have any other tips or advice for surviving life with a newborn baby? Let us know in the comments section below. You’ve been growing your little bundle of joy for 9 months, you have been Googling every article to do with pregnancy and birth, but what about when you actually have your baby in your arms and the midwife says: ‘You’re being discharged today, it’s time for you to go home’. What then? I was guilty of spending hours preparing for the pregnancy and birth that I didn’t think much about how I was going to cope with newborn babies. I felt like I should have been vetted or something…’What, so I’m actually allowed to go home…with two babies…do you not want to check that I’m actually capable? ?’ I felt like I should have had some sort of degree certificate in order to be gifted with such a responsibility. But alas, no. So what tips and advice would I give to someone who has just entered into postpartum? Looking after newborn babies. During postpartum it is really important to take it easy and look after yourselves so that you are able to look after your babies. You must, must must say yes to help. Even if it is to have someone come over for a couple of hours and cook you lunch, bring you milk, do your laundry or let you nap. You are going to be exhausted, overwhelmed and beyond elated. All of your energy will be used up on feeding, changing and just gazing at your brand new baby. Let someone look after all of the other stuff. I wish I had bought some ready made formula as a back up. As I was getting to grips with expressing, I felt massive pressure to pump enough milk for our babies. Having some formula to fall back on would have elevated some stress. It’s normal to check your baby’s breathing. Like, all the time. You are not crazy. Just a new mumma. No apologies needed. Prepare many changing stations or at least have changing supplies around your home. That way you don’t need to keep walking up to the nursery room to change nappies. I did this after day 1. Walking up and down stairs to change nappies every 2-3 hours after a C-section wasn’t going to happen. It is absolutely acceptable to not have guests for the first few weeks if you don’t feel up to it. You have just given birth, you’re trying to fumble your way around learning how to look after a new baby (or more…) and the sleep deprivation will take its toll. Be easy on yourself and see people when you are ready. People are very understanding. Make sure you look after each other so that you are able to look after your babies. Take it in turns to nap when you can. If you brush your teeth once a day and change your underwear, you are winning at life. I applaud you. I remember the first few days I was home, I had stayed in the same pyjamas for 3 days and didn’t brush my hair (poor Pete). Once I had got into the swing of things I began putting on a little bit of make up and stopped relying on dry shampoo to freshen up. This helped me to realise when it was night and day (as you’re awake all of the time you lose track) and to overall feel more human. One tip that literally saved Pete and I from malfunction was taking it in turns or ‘shifts’ to look after the babies. As I was expressing and topping up with formula Pete was able to bottle feed the babies whilst I had a good 3 hours of sleep (you will not believe how grateful you will be for that much uninterrupted sleep…!) and then I would take over. We didn’t see the point in both of us being painfully exhausted. It’s ok to need a break. I think trying to recover from the birth is demanding enough, let alone then being needed by your baby day and night, every hour of every day. If you need a breather, get someone to watch your baby, even if it’s just for a couple of hours whilst you have a little bit of precious time to yourself. A happy mumma means a happy baby. Do you have any tips or advice about postpartum that you would like to share? Let us know in the comments section below.